WordPress Themes are soul of one’s blog and play important part in getting readers attraction. Either using free or premium themes doesn’t matters. The theme should have enough gorgeous readability and design to stick the readers and visitors, and make them come back. A perfect wordpress theme helps in returning visitors, because it creates a image in reader’s mind. If we take example, recently The Next Web Magazine is redesigned, and I must say the use of Ajax and jQuery is perfect there. They are using the font Benton Sans, a premium font which looks good in the headings, but doesn’t makes good readability in the content area, it is too thin. What I mean to say with all this is, a perfect wordpress theme should be properly functioning theme. We have compiled up new wordpress themes which are released in 2012 and they will definitely make you happy if you are searching for wordpress themes for your blog. These are hand picked wordpress themes which I personally like and hope you would too. These are not just the wordpress themes which can be used for blog, we have selected one of the best wordpress themes from everywhere, whether it is premium or free, magazine or portfolio, this collection is the best of – wordpress themes released in 2012. Metro is a Premium WordPress Theme from MyThemeShop, a new wordpress themes marketplace. Metro is a responsive wordpress theme which can be used for magazine as well as blogging purpose. It uses external font, and the typography is pretty good. Loads fast and have theme functions panel for you to tweak your theme. Its good idea to use this wordpress theme for blogging purposes, specially tech blogs and magazines too. It has got built-in wordpress slider and this wordpress theme has got footer widgets too along with custom widgets for Social Profiles and Tabbed Posts. This is a special magazine layout wordpress theme from Themeforest’s popular developer Maximus, which comes with 3-column design. It has got 5 built-in widgets which can used in 3 widgetized areas. This wordpress theme has built-in content slider and good color combination. Unfortunately this theme is not responsive but even then, its worth using for magazine purposes. Origin is a portfolio wordpress theme from Elegant Themes, a clean and modern wordpress theme which is highly customizable. 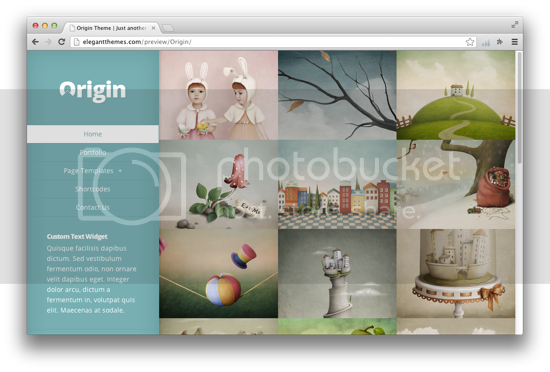 This is one of the best portfolio themes I have ever seen. The theme is responsive and it uses advanced jQuery functions for resizing the images automatically, that is what we call Responsive Images. 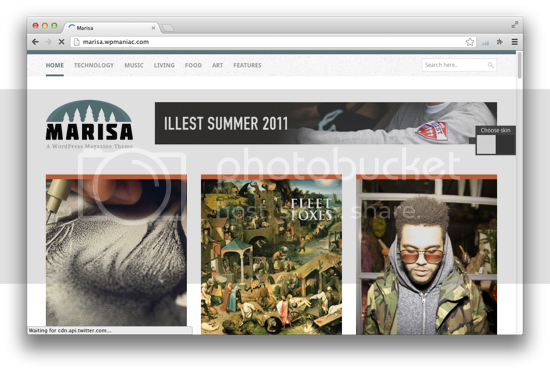 Photo Bloggers can also use this wordpress theme, it has got good color combination and it loads pretty good. Again from the themeforest marketplace, the theme author says its a portfolio wordpress theme but it looks more like a review theme, and I would say its a multi-purpose theme for wordpress users. It can be used for blogs, portfolio and review purpose. It is a premium theme which has got custom widgets for various purposes, and custom shortcodes too. It isn’t responsive though. 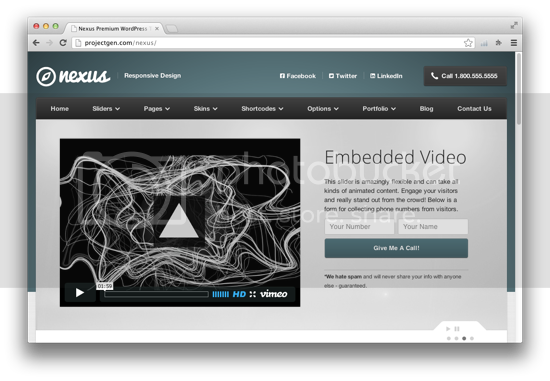 Nexus is a themeforest based wordpress theme. Its among best business premium wordpress themes I have seen and it has lot of options to customize. It has got Google Webfonts support, SEO Ready and this is deeply responsive. It comes with 3 custom sliders which are customizable too. If you are searching for a business theme, then this is the one you should go for. 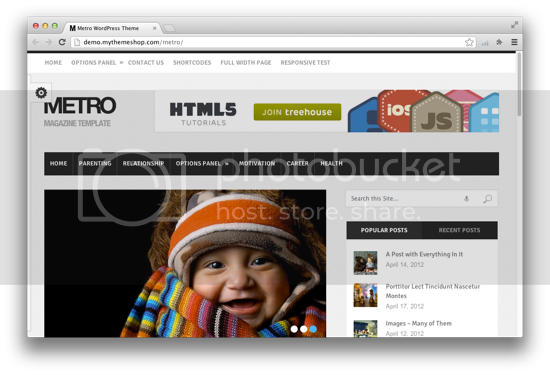 Matro Theme from MyThemeShop is my favorite..
Metro is really a good magazine theme. 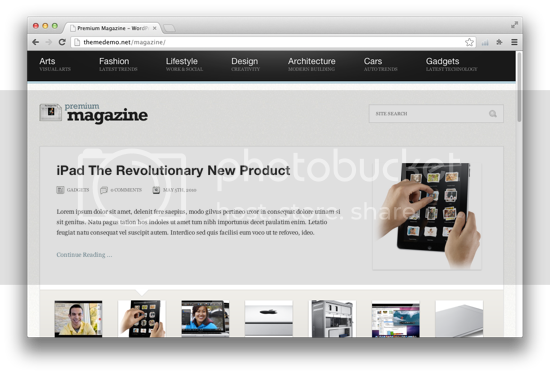 Ooh never seen that premium magazine theme on themeforest before, looks like the Forbes site. Might have to pick that up, thanks for the great list.